To be effective at your home business you need a functional workspace that ensures maximum productivity. 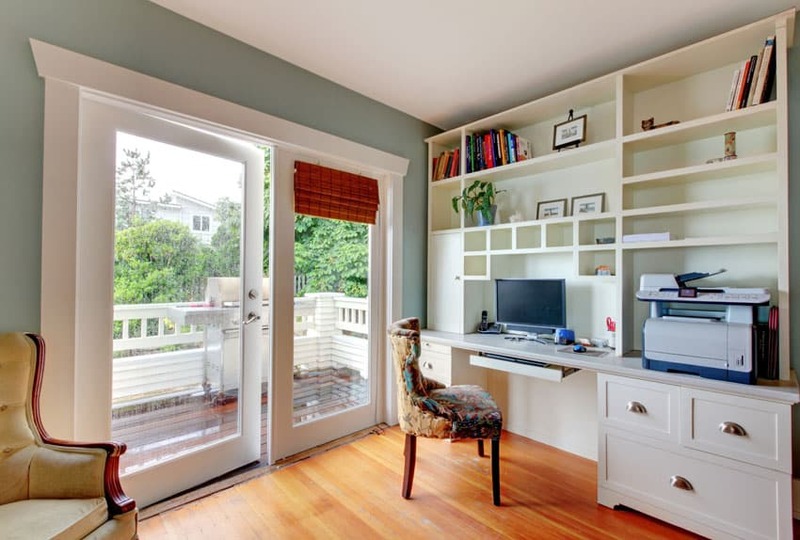 When considering small home office ideas its important to select a space that offers plenty of natural light, privacy, and storage to name a few. 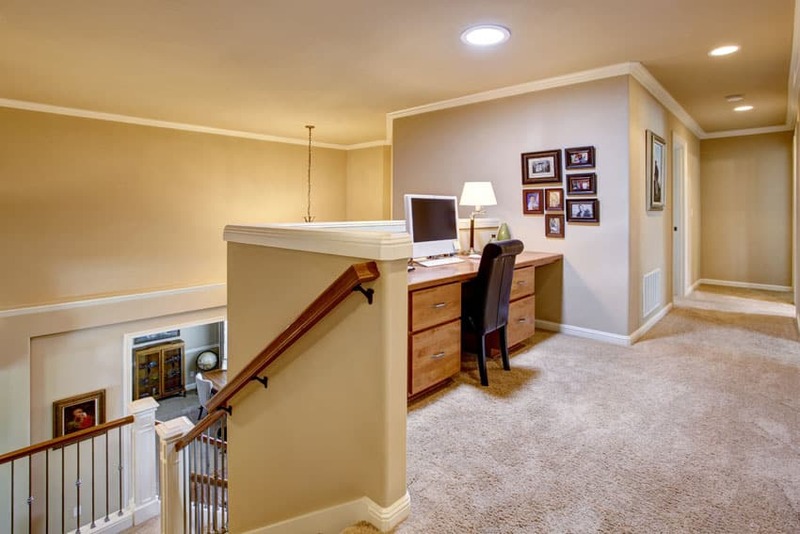 Below well cover some of the ways to implement an effective home office design in a variety of rooms in the home for best results. In this age of technology, remote working or “work-from-home” set-ups are getting more common. 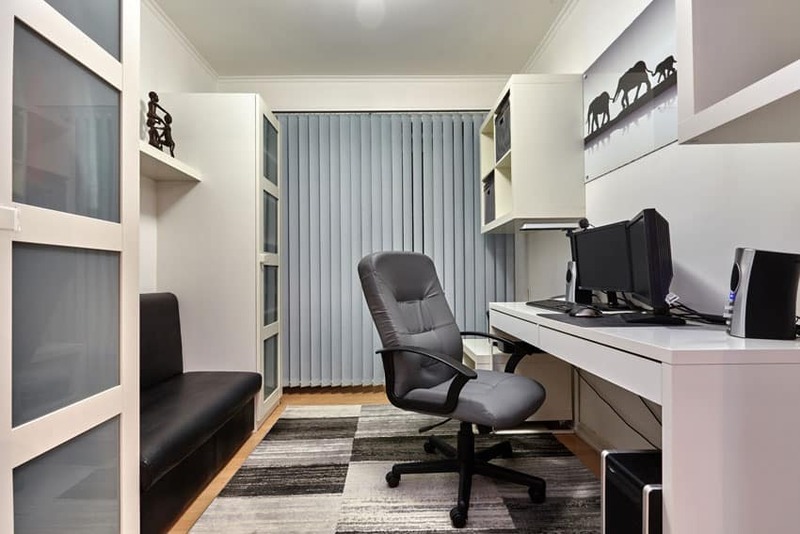 Home offices are also required for people who like taking home “homeworks”, or simply enjoy having a personal working space in their home for personal use. 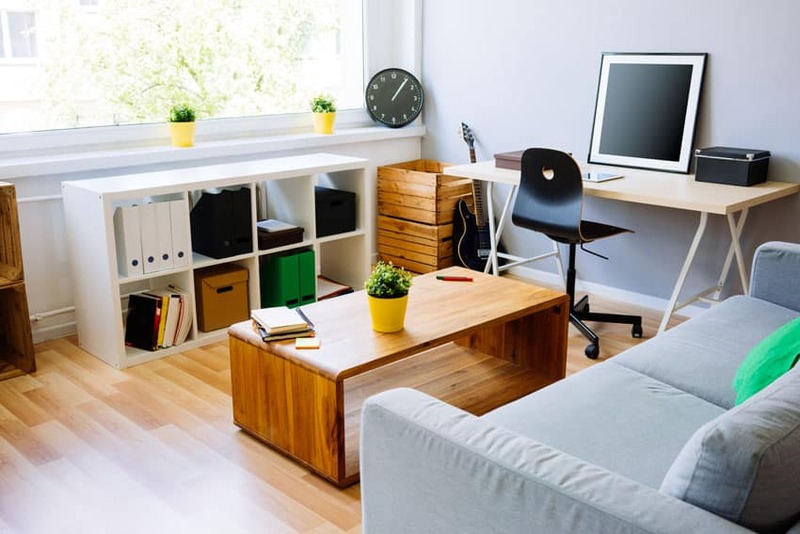 If you have limited rooms and spaces, adding an office into your house could be quite challenging, as you may have to consider sacrificing some existing spaces or combining some space with the office. Aside from the style and look, the most essential part of any home office is its functionality. The best design is one which was designed around how you work, as it helps you become more efficient and gives you an ambiance conducive for productivity. 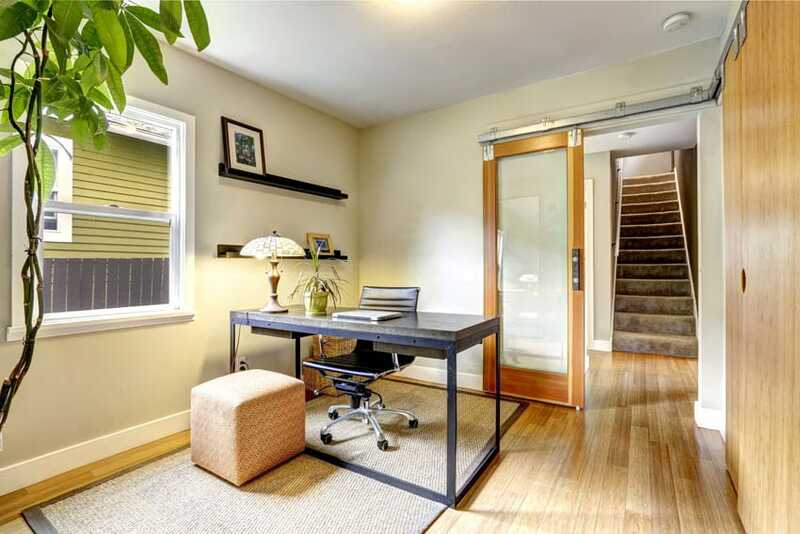 In the picture above a small home office features a large glass door leading from a terrace providing a bright and efficient space for working. During hotter hours, the blinds attached on the window can be used to block off some of the sunlight, creating a comfortable working environment. The office desk used integrated shelves into the design to maximize storage capacity, and uses plain white color to make it stand out against the sage green wall paint. List down your equipment and storage needs – will you be using a desktop PC, a laptop, a drawing board, books? All of these are important factors. Consider your working habits – there are those who prefer silence and privacy, but there are also those who work more efficiently in more crowded spaces. There are very neat/organized people, and there are also those who prefer a bit of an “organized mess” to work properly. Whatever type of worker you are, always keep you habits in mind in designing your office space. Always remember that your office is only as good as its function, so make sure that your design works according to your requirements, and not simply for aesthetic/style purposes. Combining natural textures with subtle industrial style details creates a nice contrast of “warm” and “cold” finishes. Following the general style of the house, the walls and flooring of this small office uses warm neutral colors – oak flooring and light cream walls, paired with wooden doors and cabinetry. 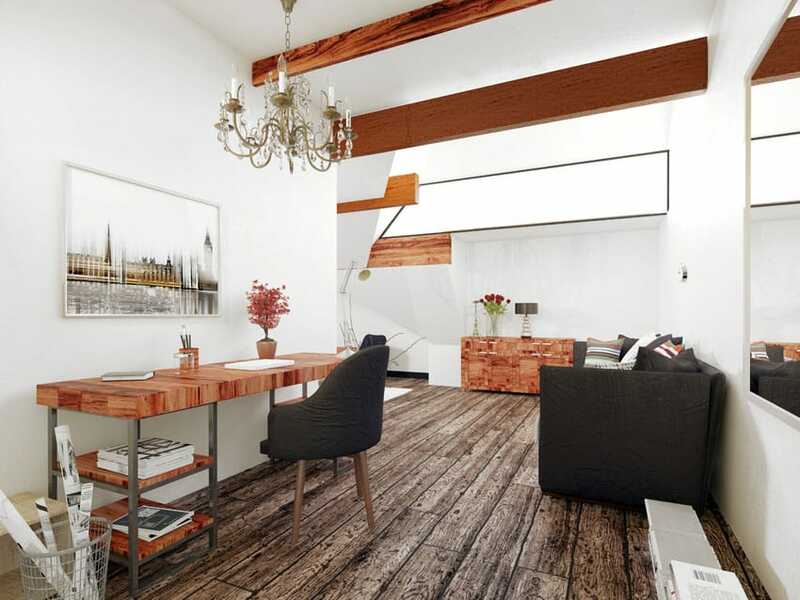 To add a little contrast, you will see an industrial style desk with black metal legs and concrete top, as well as an exposed metal track for the sliding door. Going for a more formal look, this small office uses a monochromatic color scheme, adding a few touches to patterns and textures to help make the space look more interesting. Despite the small size of the office, the storage spaces are maximized through cabinets and overhead shelves. To soften the over-all look of the space, a gray, black and white area rug, as well as a black leather bench were used to add softer textures to the space. Clean and minimalist, this small work top was placed against the gray accent wall of the room, making the white desk stand out. 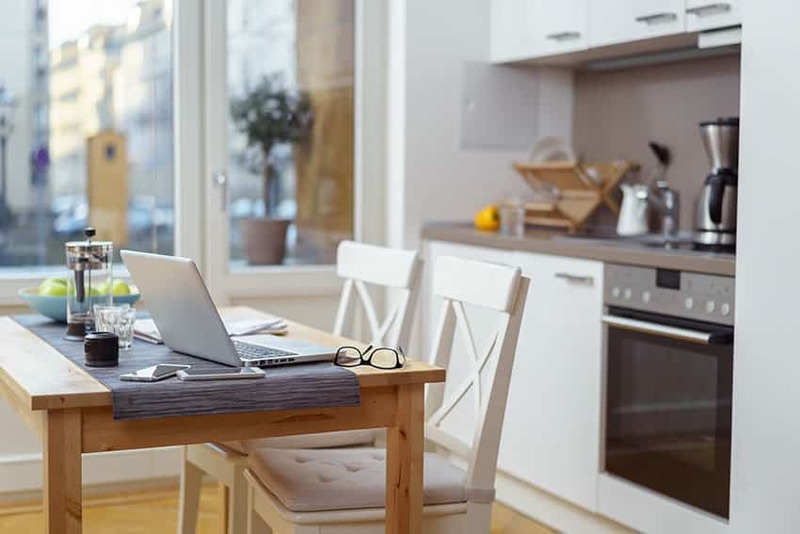 Because of the limited desk space, a minimalist approach is needed, and there area no other storage receptacles placed on the table to help keep it clean and clutter-free. If you want a very formal/official-looking office, then going for a Victorian-style office design will best give you that official/institutional appeal. This example adds a few key pieces to give it an institutional appeal, while keeping a neat & clean modern feel at the same time. The main furniture pieces such as the desk, desk chair and the guest chair all has a classic silhouette & are finished in dark wengue. To make it pop-out from the similarly-toned wood flooring, a traditional area rug in black and gold was used. The rest of the office keeps subtle warm tones and clean finishes to balance the look. Despite being small and narrow, this modern office space has sufficient natural lighting from its large window which gives it a bright and refreshing feel. Because of the limited space, light finishes were chosen for the floors and walls. Furniture pieces were also kept simple and minimal to avoid overwhelming the small space. 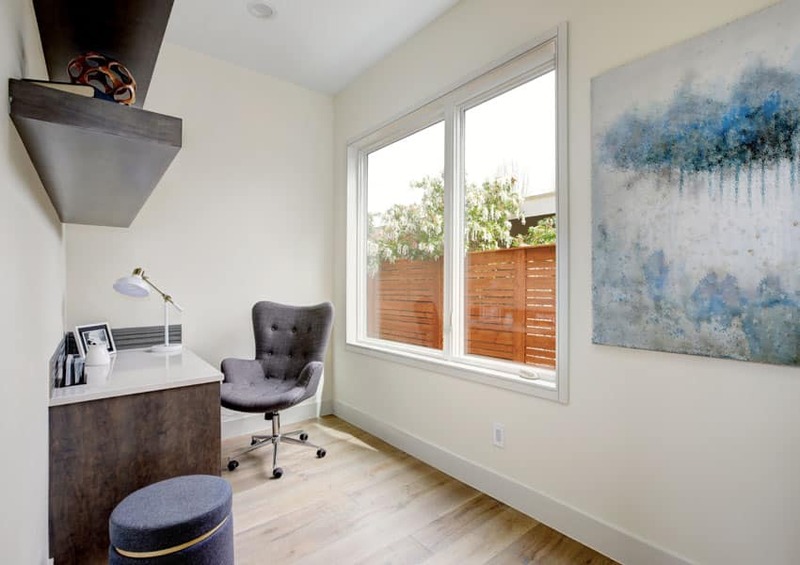 A wooden desk and two overhead shelves were paired with a Scandinavian style swivel chair and storage ottoman, giving it a youthful appeal, especially when paired with the white and blue abstract artwork on the wall. This small office spaces goes for a more casual, youthful appeal, using laid-back furniture pieces and accessories to decorate the space. Wood vinyl flooring paired with cool gray walls gives us a refreshing contrast, which is also carried over to the choice of colors for the furniture pieces. 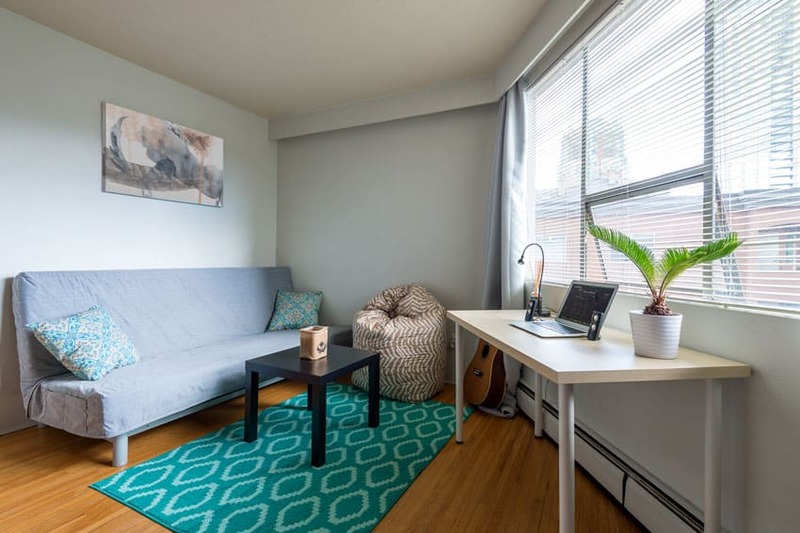 The small office has a light gray love seat and a solid wood coffee table. It also has a couple of storage shelves and wooden crates converted into boxes/shelves. Placed against the gray wall is a modern desk in white and light beech, for a clean & crisp look. 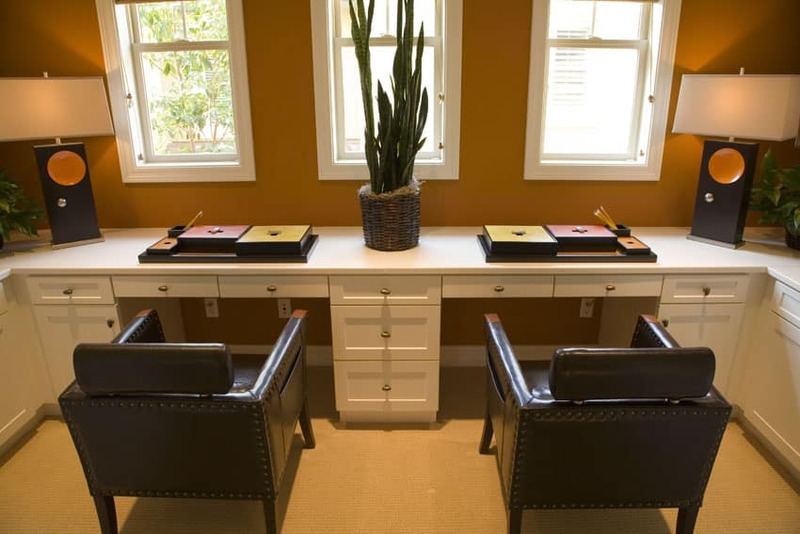 The bold golden yellow wall paint helps the all-white built-in desk stand out better. To maximize the available space, a custom-made U-shaped desk was made to accommodate 2 users at a time. The desk has a lot of drawers for storage, helping create a clutter-free desktop. The office desk was also strategically placed in front of the window to give you a bright workspace, and allow you to take care of indoor plants as well. One of the spaces you can share the office with would be the bedroom, as it offers privacy and easy access to materials and amenities available in the bedroom. After working, or in between breaks, you can simply head straight to the bed to relax or sleep a bit, and that’s usually what makes it an attractive option for some. However, some people do not like sharing their “resting space” with their “workspace”, so bear that in mind when it comes to designing. By the window – since beds are usually placed away from the window both for privacy and for comfort, the space right by the window is often left unused. This is a perfect spot for office desks because of the natural illumination. 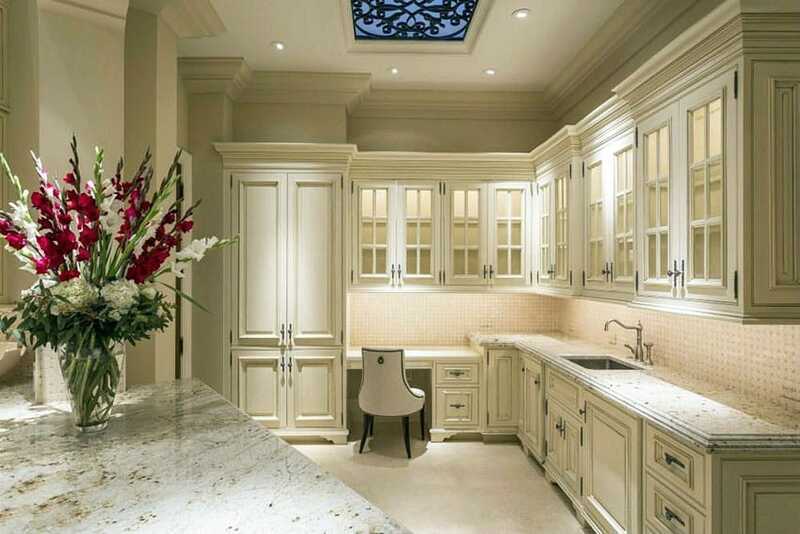 Along the cabinetry – you can integrate a desk to match with the existing clothes cabinets. Spaces right by the window are often wasted, especially when the wall is angled awkwardly just like in this example. One way of efficiently using such spaces is to place a movable desk on the wall for an instant mini-office area. The light from the windows will give you sufficient daytime illumination, allowing you to save on electricity for artificial lights. This is the same space as the previous image, but with the sofa-bed opened up for sleeping purposes. You will see how the small desk placed by the window is able to make use of the awkward space and angle for the wall. The simple silhouette of the desk also matches the modern aesthetic of the bedroom. Some homes don’t have enough rooms for separate offices, so sometimes, offices are integrated into the bedrooms. In order not to ruin the relaxing atmosphere of the bedroom, the office furniture pieces chosen must match and blend with the other bedroom furniture, such as this example. White Rococo antiqued desk with a matching chair was placed against the window to serve as the mini office. This example shows a great way to integrate bedroom and office space into one, yet creating a clear division between the 2 spaces so as not to impede the atmosphere. 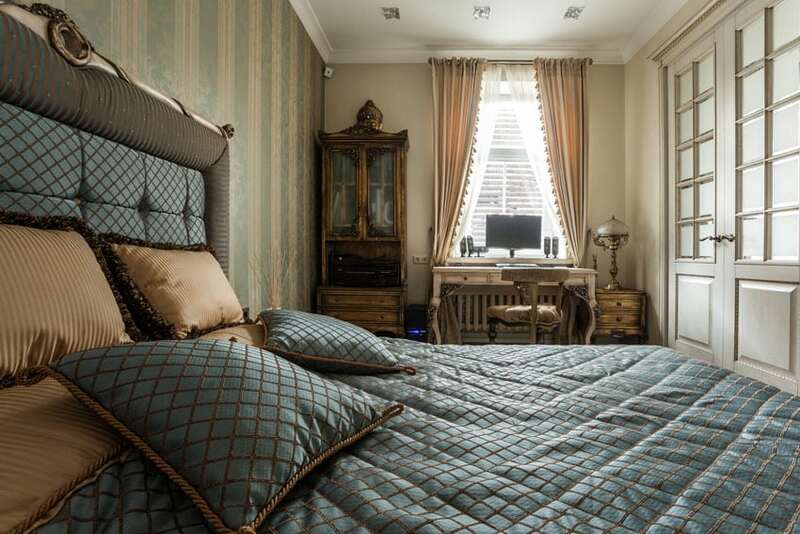 The desk was strategically placed in a corner of the room which is not directly visible from the the bed, so you still get to enjoy the relaxing and cozy ambiance of the room without having to see “work”. Since not everyone is a fan of combining office & bedroom spaces, another option you can do if you don’t have a dedicated office room, would be to combine the office space with the living area. If you have a spacious living room, you can easily place it against any free wall, or even behind a sofa. This small office desk is placed against a wall in the living room and matches with the overall style of the living area so that it doesn’t stand-out too much. It was also strategically placed on a wall which will block the view from the TV, allowing less distractions. 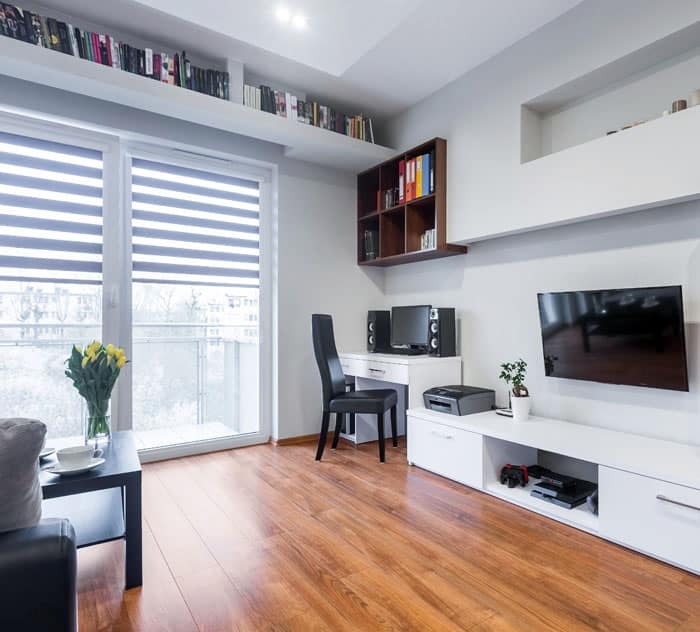 Another way to integrate the office into the living area is to connect it into built-in furniture pieces, which in this case, is the entertainment console. The small desk seems like part of the entertainment console, placed right at its end, near the sliding door for natural light. This also allows efficient electrical wiring, as all outlets will be on one wall for this set-up. If you feel that the living room is a bit too busy, yet refuse to place your office in your bedroom, then consider putting in the dining area. Despite being another common room/area, it is fairly more quiet compared to the living room and is usually only very busy during meal times. When not in use, the dining room could feel a bit more private compared to other common spaces in the house. The dining table can serve as an extra working space, too, when it is not in use. Dining rooms often have sufficient natural and artificial lights as well, creating a space conducive for productivity. 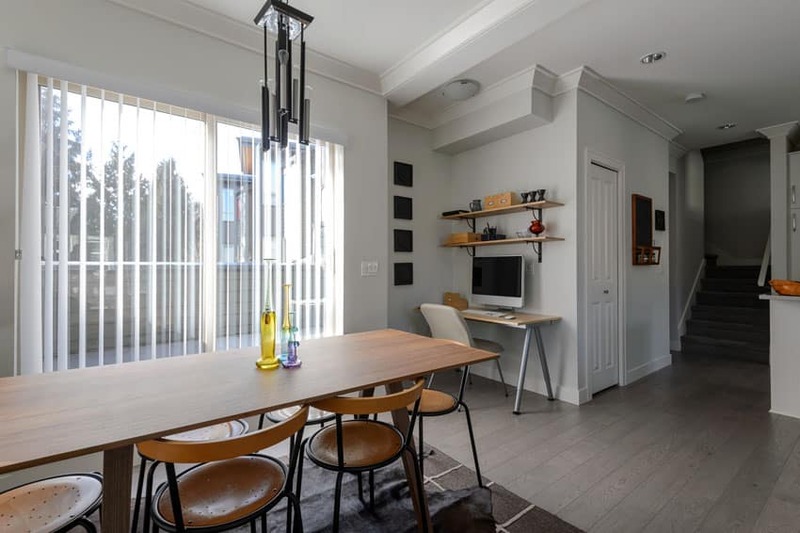 In this example, you will see that there is an unused spaced at the corner of the dining area, which was transformed into a small office space. The location affords privacy to help you concentrate on your tasks. The small breakfast table in the kitchen in this photo is being used as a makeshift office space. This is effective only if you only have a few equipment and materials which can be easily moved into the breakfast table, as it doesn’t have accessible outlets, which would make it difficult if you need many things plugged in. It might be unusual for some, but it is also possible to integrate a small office area into the kitchen as well. Similar to the dining room, the kitchen is also a common space, yet it usually less busy compared to the living room. You can easily integrate desk designs into the kitchen counter design and it wouldn’t even be noticed. The undercabinet lights can also be used as efficient desk lamps. However, placing the office in the kitchen might be a bit distracting, with all the snacks and smells around you. It could also get a bit messy and busy during meal preparation and clean-up. You have to make sure you place your desk where it will be away from water spills or heat/fire. The kitchen is often the center of activity in a home a may not provide a quiet or private environment depending on the size of your family. It might be unusual for some, but it is also possible to integrate a small office area into the kitchen. Desk heights are close to standard counter heights, so it is very easy to add a desk into the kitchen counter design such as this example of a French style kitchen. It was able to fit in a small desk at one side, giving it a private corner of the kitchen, away from fire and water. The remaining space in between the pantry cabinet and the wall was used as a small office area which uses white storage cabinet base topped with solid wood desktop. It also uses the overhead space for display shelves, efficiently using the wall space. Homes and apartments sometimes have awkward corners and nooks which are oftentimes ignored. Oftentimes, these small spaces are used for storage of infrequently-used items, or as additional sitting areas. 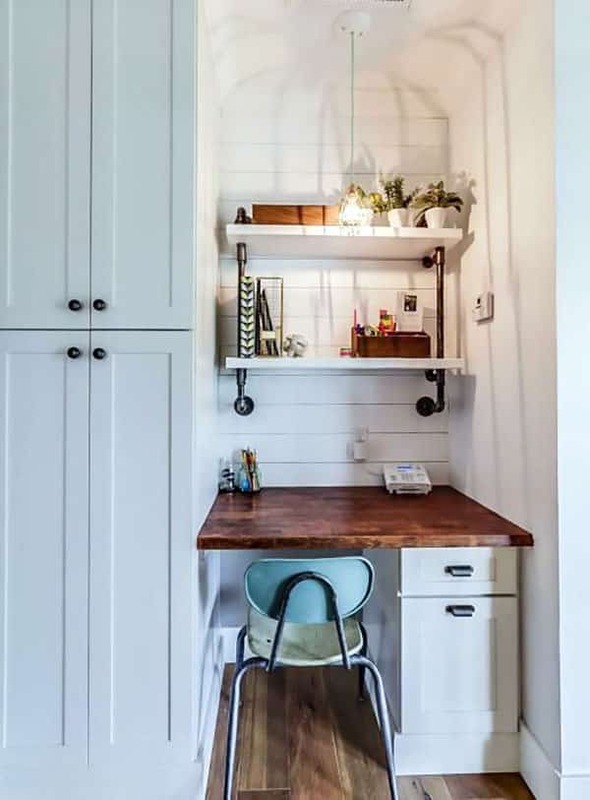 However, if space is sufficient, you can also use these nooks and dead corners as small offices. These locations can be private and quiet, which is sought after as ideal working spaces for those who prefer to work in silence. Do take note though, that these spaces are oftentimes lacking or completely devoid of natural lighting, so make sure that artificial lights are sufficient. Since a nook often has a very limited amount of space you will need to build up and use as much of the nearby walls as possible. Shelving with closed storage can help the space look more attractive while still keeping items easily accessible. This small office was placed right by the railings after the stairs, and along the hallway of the rooms. 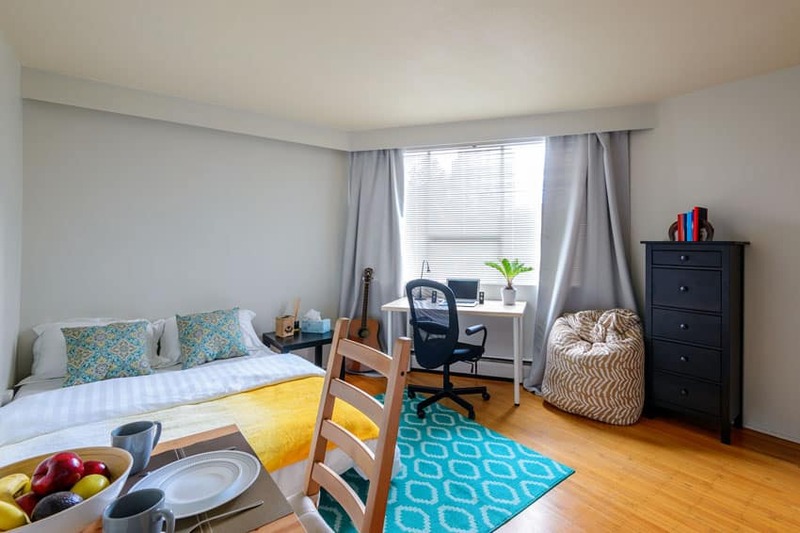 There is enough space to place a large desk and a desk chair without impeding traffic in the hallway, and the area is away from private & multi-user spaces, so you have a fairly quiet and private time in the area. An awkward yet spacious nook between rooms was put to good use as it was transformed into a mini office. 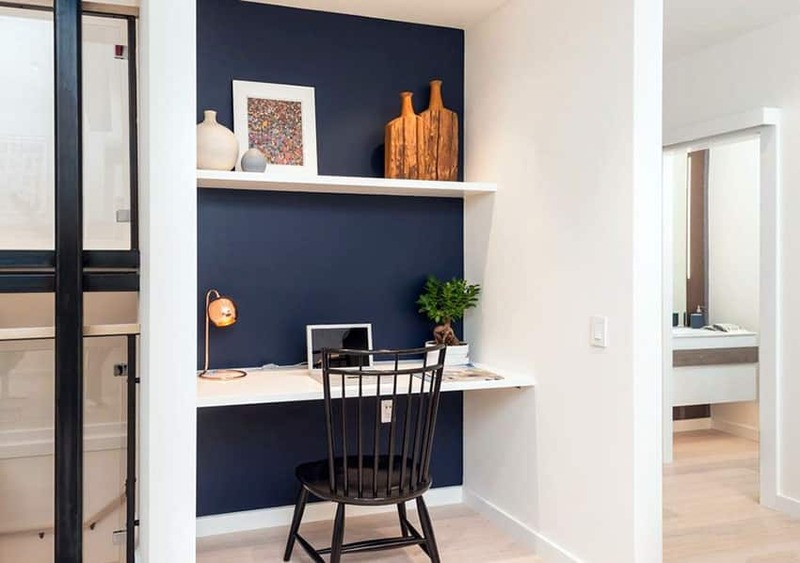 One wall was painted in navy blue, making the white cantilevered desktop and overhead shelf standout. 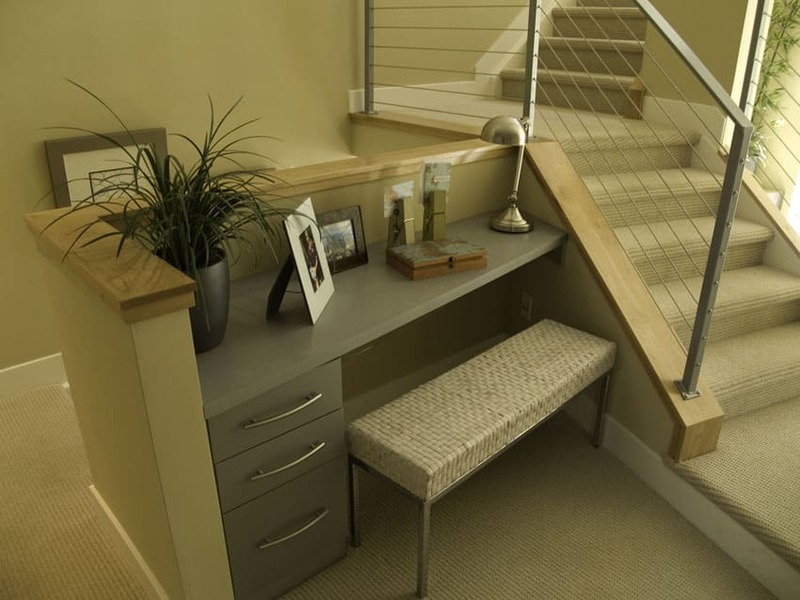 This small pace right beside the stairs might have gone unused, but a few tweaks on this gray office table top, and here we have a small and cozy office space with enough privacy and easy access to the other parts of the house. If you have surplus space in your walk-in closet or wardrobe, you can also convert some of it into a small office. That way you do not invade the sacredness of the bedroom with work, yet have easy access to bedroom items and amenities. Placing it in walk-in closets and wardrobes still allows you to delineate the space between the office and the bedroom, so the ambiance of the bedroom is not changed. Converting a closet in to an office space does pose some challenges. For starters, the depth of a closet is typically quite limited. You will want to measure the space and select a desk and storage cabinets that can comfortable fit the space.One way to create more space is by removing the closet doors and opting for a room divider or curtains that can be used to close off the space when not in use. While many closets have plenty of potential for hanging clothing they don’t offer much in the way of shelving. Installing some shelving can help you create a functional space. In addition, many closets don’t have many electrical outlets which may require you either installing some additional wall sockets yourself, or hiring a professional electrician. 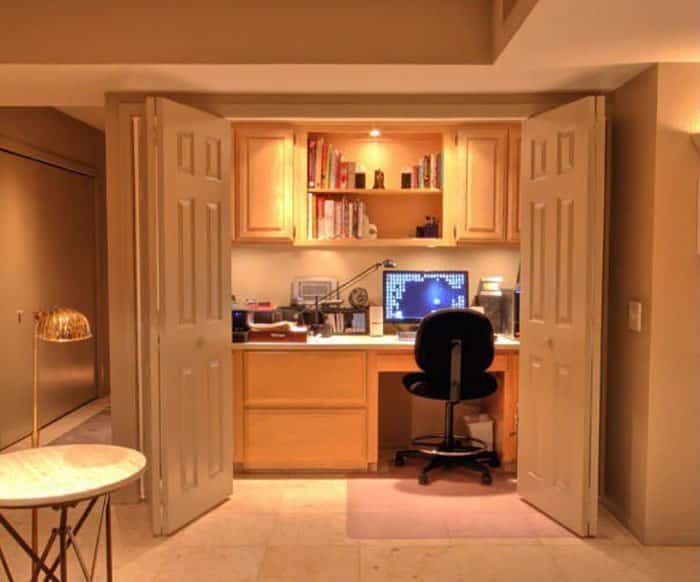 Here are some interesting of wardrobe and walk-in closet offices. This example converted the whole wardrobe into a double desk office made from wood painted in cobalt blue. When not in use (or even when in use), you can simple close the sliding wooden doors to hide the office. 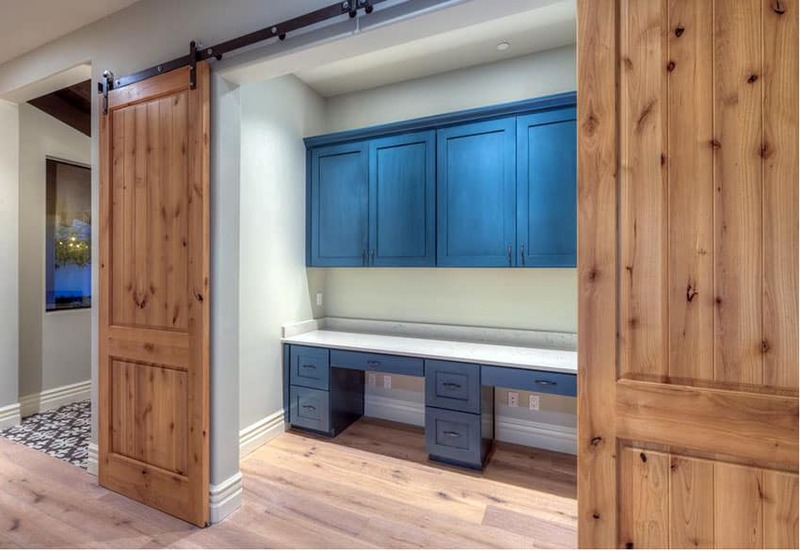 This small walk-in closet was fully converted into a small office. 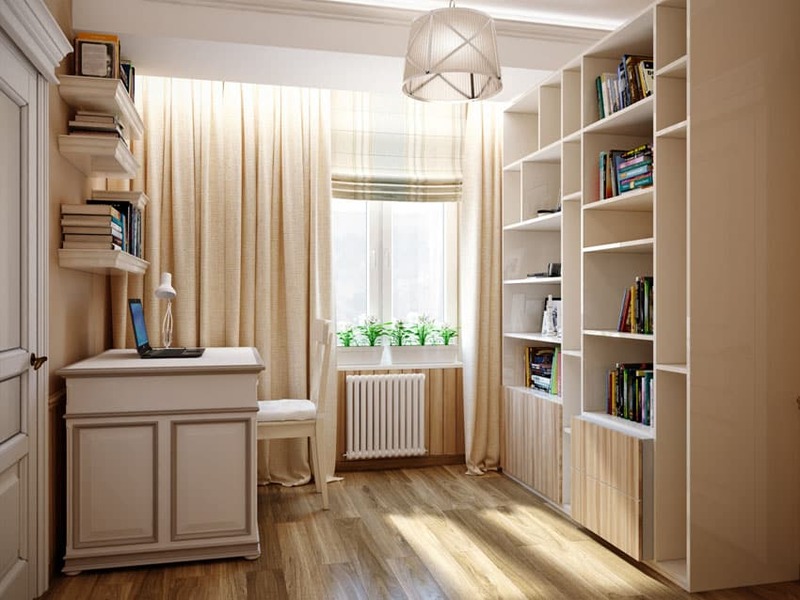 Instead of a closet, you will see a storage cabinet for books and other office items. Right by the window is the classic desk with overhead display shelves for books and other items. 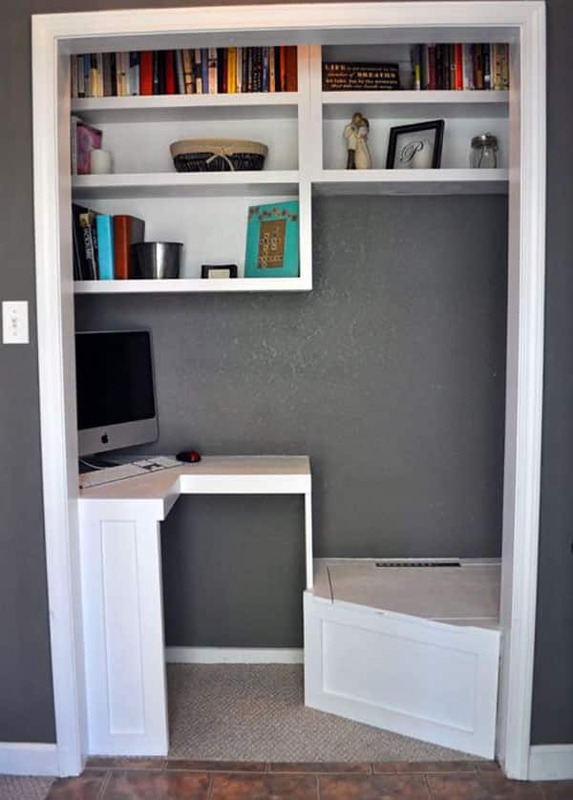 This is another example of a wardrobe converted into a mini office. Unlike the blue wardrobe office, the space of this one is smaller, so you need to keep the bifold doors open when you intend to use the office, and only close it when not in use. Even if your wardrobe space is even smaller, you can still create a mini office in the available space, making sure you use custom-made furniture pieces that will fit perfectly into the available shape and space of the wardrobe. 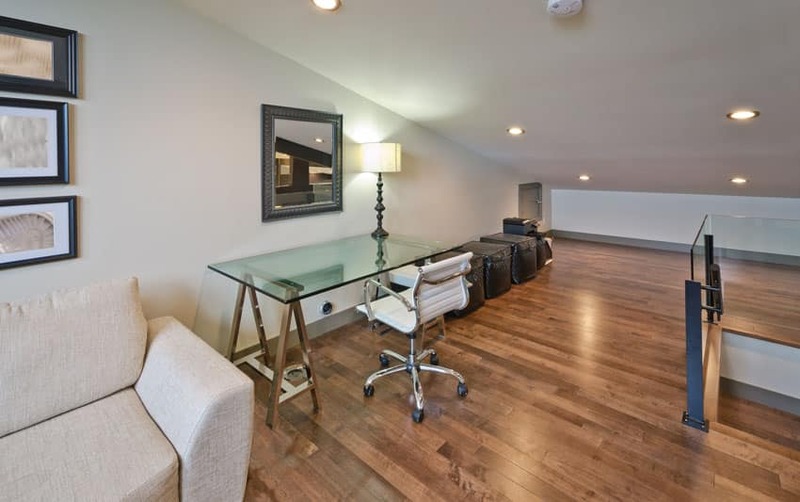 Attic spaces are often used for storage or as an extra bedroom, but you can also use the attic space to create a small home office, as it offers a private space and considerable exclusivity. Attics also have unique/dynamic layouts, which can be both fun and challenging. 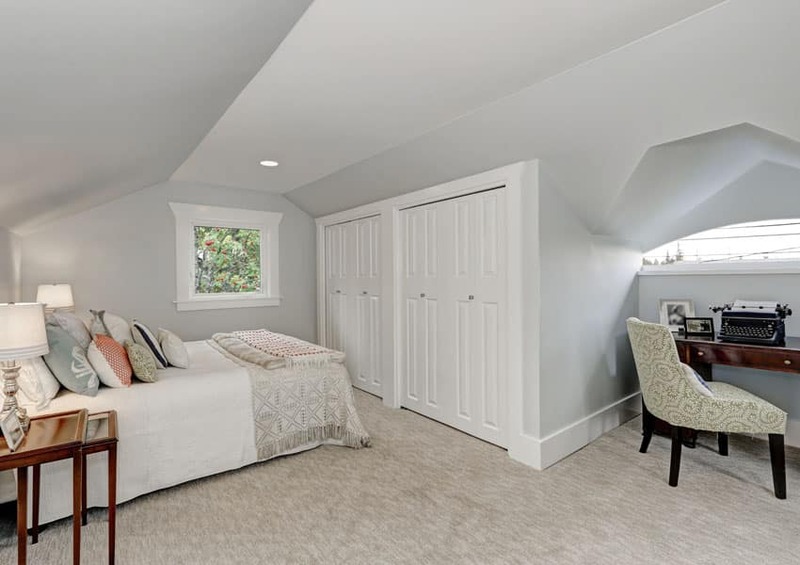 Since many attics have unusual layouts it may be a good idea to use custom built-ins for storage as they can easier conform to the space than traditional office furniture. To make the attic comfortable consider adding houseplants, cozy carpets and a few comfortable seating options. 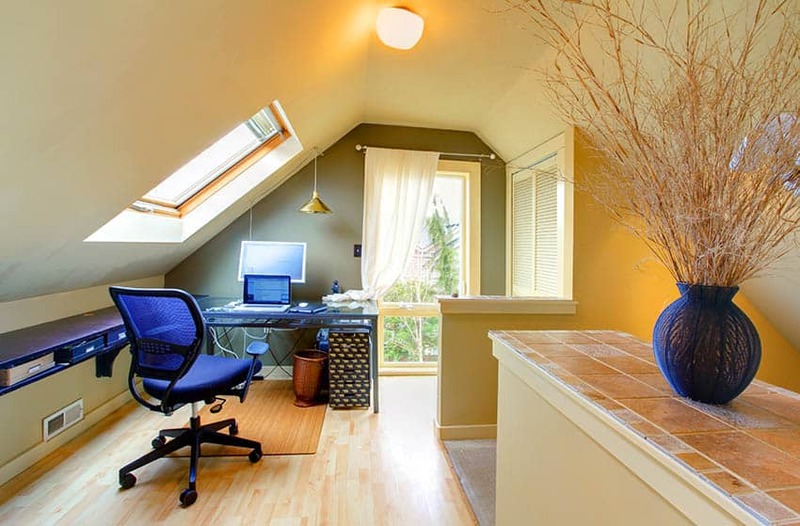 Another thing to consider when making an attic into an office is to get rid of the clutter. That means finding another spot for anything you might have stored away in the attic over the years. This home office maximizes the natural light seeping from the skylight, placing the desk nearby for a well-lit workspace during daytime. It also uses the available space efficiently by adding storage spaces on the low side of the ceiling so there is no dead space. A very simple, classic-style attic home office which is simply composed of a solid mahogany desk with an upholstered mid-back chair with a bold yellow and green print. 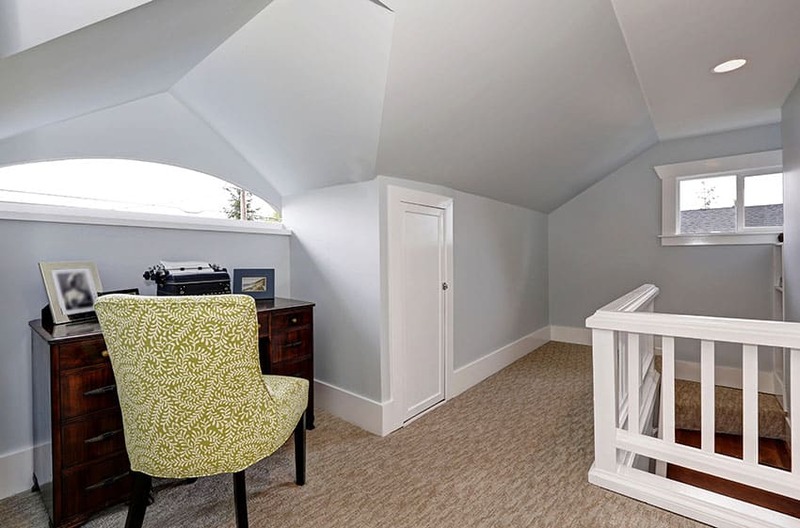 The sloped ceiling of attics can be a challenging space to work on. In this example, the ceiling is too low for a bed, so a glass desk was used instead. The area with even lower ceiling height was where the storage baskets were placed, as they are not accessed often, and will not be a problem when it comes to ergonomics and accessibility.